My Creative Existence: Goth girls! I was so excited when I found these fabulous goth girl stamps that I just had to buy up big! I've had them sitting in my stash for a while now, waiting for the perfect opportunity to get them inky! LOL! They remind me of when I was a teenager - whilst I wasn't quite that bad, I would still have been classified by some people as a "goth" - I wore all black - long black skirts, long black hair, grunge music - you get the picture! I'll have to dig up an old photo and share it with you - let me know if you wanna see it! :) Ahhh - those were the days. Good times. LOL! Anyway, I recently joined a yahoo group where we swap ATC's and other arty goodness, which presented the perfect opportunity to use my stamps! Can anyone tell what my fave colour combo is lately?? LMAO! The spine is a metal hinge, and I have used marble paper, German Scrap Borders, riggon, and a Maya Road ribbon slider. 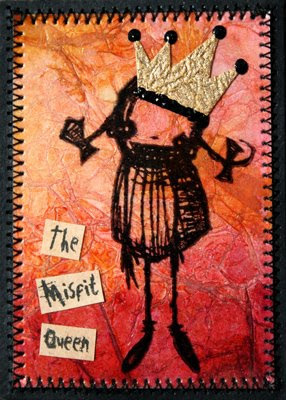 I have used my goth girl stamps, basic grey paper, white gel pen, and sticky words from Kelsey O'Mullane. 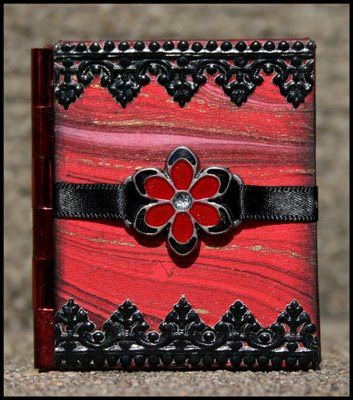 My little mini book has gone to a new owner who I am pleased to say was thrilled with it! I got one from her in return, and it is fabulous! I'm loving this swap group! I love your Stampotique goth girl stamps Sarah!!! The mini book looks fantastic and thanks for using my clear sticky words! Let me know if you have any suggestions for other words to use. Bet the girls were really happy when they received their caught in crystal atc's too. The goth set is the cutest. See that you have a Ruby Street button on your blog, have seen their advertisement recently and thought they look the coolest in Australia. 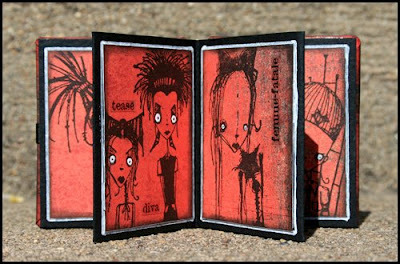 I loooove the goth girls Sarah - what a fabulous little project! 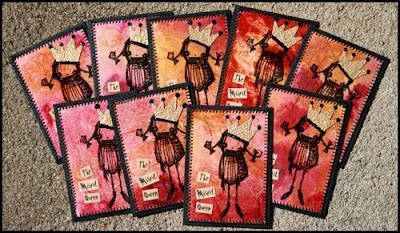 These really caught my eye - what a fab set of atcs. Not stamps I would normally associate with - but they are perfect on your backgrounds. SO so so so soooo cool... I love those colours too and have been finding them on a bit of my work lately - funny how that happens without any intention.. I know there will be eight pretty happy people out there in "ATC swapping land" after receiving those.